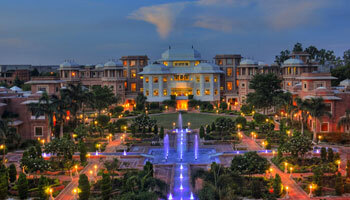 Wyndham Grand located in the city of Taj, has been built on 18 acres of land with the large frontage. A beautiful hotel property inspired by the intricacy of Mughal architecture with splendid display of terraced lawns, fountains and ancient interiors that take you back to an era of emperors and princes with the modern facilities. It is a masterpiece of architecture is built on ''Mughal Theme'' with world class modern hi-tech amenities. It is attracting global leisure & business Tourists from all over the world. It’s easy to approach location is another big advantage. The royal ambience, the intricate craftsmanship and the beautiful landscape makes it the most preferred destination in the itinerary of tourists. A visual delight for holiday makers as it revives the grandeur of the Mughal Emperors. Backup Generator, Breakfast Services, Parking, Security Guard, Currency Exchange, Doctor on Call, Travel Counter, Laundry Facilities, Airport Transportation, Room Service. Attached Bathroom, Toothbrush/Razor on Request, Air Conditioning Room, DVD Player, Cable/Satellite TV, Iron/Ironing Board, House Keeping, H/C Water, Wakeup Calls.